What’s Behind Saudi Arabia’s Changing Foreign Policy? FILE - Images of King Salman, center, Crown Prince Mohammed bin Nayef, left, and Deputy Crown Prince Mohammed bin Salman hang at the entrance of a shopping center in Riyadh, Saudi Arabia, Dec. 14, 2015. As President Obama begins talks in Saudi Arabia, U.S. lawmakers are questioning the expanded Saudi military role in the region as well as Washington’s longstanding alliance with Riyadh. "I'm increasingly worried the Saudi-led bombing campaign in Yemen is not supporting U.S. national security interests," said U.S. Senator Chris Murphy (D-CT), who has introduced a bill to halt munitions sales to Riyadh, believing the chaos in Yemen has made it easier for jihadists to operate. Separately, Senator Chuck Schumer (D-NY) is pushing a bill that would allow families of 9/11 victims to sue foreign sponsors of terrorism in federal courts. Victims’ families also are demanding the release of 28 pages removed from a congressional report on 9/11 that some believe would reveal Saudi involvement in the attacks. But are they misreading the Saudi position? In this photo provided by the Saudi Press Agency, Saudi King Salman delivers his first major policy speech since assuming the throne in the al-Yamama palace, Riyadh, Saudi Arabia, March 10, 2015. King Salman dismissed the former crown prince and replaced him with nephew Mohammed bin Nayef, the first of the younger generation of princes in line for the throne. Formerly chief of counterterrorism, Prince Mohammed successfully fought al-Qaida inside the kingdom and was viewed as well-placed to fight Islamic State. Saudi Deputy Crown Prince and Interior Minister Prince Mohammed bin Nayef bin Abdul Aziz , October 20, 2012. The king also named his son Mohammed bin Salman as deputy crown prince and defense minister, giving him significant power over oil and military policies. In March 2015, Saudi Arabia and regional allies launched military strikes against Iran-backed Houthi rebels in Yemen and began building a new naval base in Jazan near the Yemen border. A month later, Saudi Arabia announced it had formed a 34-country (mainly Sunni) Islamic Military Alliance to coordinate efforts to fight and defeat terrorism. In January, Saudi Arabia executed a prominent Shi’ite cleric, and when protesting Shi’ites burned the Saudi Embassy in Tehran, Riyadh broke diplomatic relations with Iran. Ibish doesn’t view the Saudi actions as “aggressive” so much as “pro-active” in the face of rising Iranian and jihadist influence in the region. At stake are Saudi Arabia’s political influence in the Middle East, control of shipping in the Gulf and enormous oil reserves. He also says Saudi Arabia believes it can no longer count on its traditional ally, the U.S., to defend or arm it. This is due in part to the Obama administration’s widely touted “Asia pivot,” shifting attention and resources to the Asia-Pacific. The U.S. failed to act on the declared “red line” of chemical weapons use in Syria, which Saudis viewed as evidence it had turned its back on its Sunni allies. And the Iran nuclear deal was the final straw for the Saudis, who feared the lifting of sanctions would strengthen Iran’s hand in the region. Fahad Nazer, senior political analyst with JTG, Inc., said in an email that, “While President Obama appears to believe that the national interest of the United States is best served by keeping some distance from the turmoil in the Middle East, the Saudis seem to have concluded that their national security interests are best served by assuming a leadership position in the region. This new approach is also not averse to the use of force when necessary." 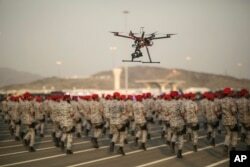 FILE - In this Thursday, Sept. 17, 2015 file photo, a drone is used to record a military parade by Saudi security forces in preparation for the annual Hajj pilgrimage in Mecca, Saudi Arabia. The war in Yemen is costing the Kingdom $200 million a day. But force costs money. Saudi Arabia spent $87 billion on its military last year, beating out Russia to become the world’s third biggest military spender. But that’s money it can ill afford to spend, given plunging oil prices. Now, the kingdom must find ways to make up a $98 billion budget shortfall and fund its military ventures. In a recent interview, Prince Mohammed bin Salman said the kingdom will shortly launch a plan to move away from dependence on oil and encourage investment. He said it will involve selling shares in Aramco, the state-owned oil company, privatizing government services, beefing up tourism and imposing taxes.